love the location. the staff at Godfreys are great. its a great little island and everyone is friendly. I will be back in June. The location, pool, staff was great. There was a restaurant just across the path from the unit and they were awesome--great food and friendly. The unit had everything we needed. Love Cay Caulker and will be back. The view dynamite. The water hot. The microwave was a bonus. Big room, clean and comfortable bed. The shower was a bit small. AC worked good. Internet signal was fine. Location was close to ferry but no beach area and as others have commented only a very small pool deck Room was clean and thank goodness it had AC which worked pretty good and ceiling fans since the was no breeze do to apartment's location. Pretty basic room with a fantastic view of the ocean! The property has most of the things a vacationer might need, including a restaurant with good food and a bar, and everything else is within walking distance, including the ferry, stores and other restaurants. Far enough from the airport to provide undisturbed rest. The location was central tho in a bit of a quieter area if that’s something you would want. Pool was nice. They had some tubes which was a nice addition. Nice spacious apartment right at the water. The room includes a small kitchen, fridge, aircon , fan, TV, 2 beds and a sofa. The pool was nice too. The staff was very friendly and helpful. When one saw that I wasn't feeling too well, the girl from the reception immediately came up to our room and checked on me. Alayna Ocean Views at The Club Caye Caulker This rating is a reflection of how the property compares to the industry standard when it comes to price, facilities and services available. It's based on a self-evaluation by the property. Use this rating to help choose your stay! Located in Caye Caulker, Alayna Ocean Views at The Club Caye Caulker offers accommodations with free WiFi and flat-screen TV, as well as a private beach area and an outdoor swimming pool. There's also a kitchenette in some of the units equipped with a microwave, a fridge, and a stovetop. The condo hotel has a sun terrace. 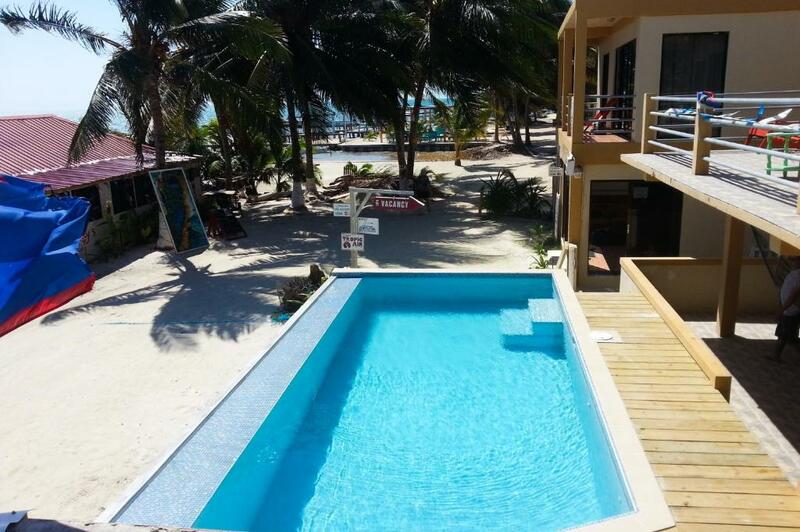 When would you like to stay at Alayna Ocean Views at The Club Caye Caulker? This studio has a microwave, private pool and tile/marble floor. This apartment features a balcony, private pool and microwave. House Rules Alayna Ocean Views at The Club Caye Caulker takes special requests – add in the next step! Up to two children under 6 years are charged USD 6 per night when using existing beds. Alayna Ocean Views at The Club Caye Caulker accepts these cards and reserves the right to temporarily hold an amount prior to arrival. One of the beds had foam over the mattress that we used so the fold out bed was comfortable enough to sleep on--so the bed we took it off was then uncomfortable. Unit could use some upgrade. The girl working at the reception looked like she did not like her job. She was not even smiling and did not like her attitude. I had to wait until 2pm so i could go in my room and had to leave my bags at the reception. When i came back to go in our room i had to wait a while until the receptionist attended to me. I really liked the location and the pool. Felt like I was living in a storage shed. Padlock on sliding door for room lock water smelled like raw sewage in sinks and shower. Beds were horrible!! Maxi pad pillows. Loud and noisy! Very uncomfortable stay! The staff(reception) is not friendly. They don't care that your toilet doesn't work properly. They don't care that the water smell like sewage. There is only the very very minimum in that room. The view. Amazing view! The cleaning lady's are super nice! Pillows shot. Mattress on the way out. Bedframe shot too. AC no cool air?! 2am noise from adjacent bar. Cramped, stuffy, and despite the name there are no ocean views from this unit. Others do but this one has windows that open to a hallway. Very dark inside the unit. I think the name is misleading. Very worn bed linens and beds were very uncomfortable. Needs basic maintenance, older furnishings are fine, but some basic repairs and upgrades to shower bathroom and kitchenette would help. Room not secure has glass sliding patio door and flimsy latch and padlock. Easy to tell when you were out of the room. No view other than people peering into your windows. and you could not leave the windows or door open since the were no screens and there were kids running up and down the hall. Lack of a beach or place to sit outside.